It’s hard to find a low sugar granola so I decided to try and experiment and cook my own based on various recipes. This recipe uses no refined sugars. This recipe is actually 1/4 batch of original recipe that it was based on. It makes about 1 quart size mason jar worth of granola. This way I make it more often and it is fresher and crisper. Feel free to double or 4X the recipe. 1 3/4 cup organic oats – I bought the organic oats in bulk for about $1.50/lb. Can be cheaper if not organic. 1/2 cup apple sauce – I used apple sauce that I made my from apples from the farm stand! 1 tbs honey – from my local bees! Directions: Set your oven to 275. Mix dry ingredients together in bowl and wet ingredients together in a separate bowl. Add wet and dry ingredients together and blend. Place the granola 1/2 inch thick on large cooking sheets with small sides on parchment paper so they don’t stick. Mix and turn over the granola with spatula about every 15 minutes for 45-60 minutes. It should be very crispy and dry but not burnt. Do a taste test when you mix and turn. Place into an air tight mason jar or container. Makes about 1 quart of granola. I tend to like my granola crunchy and crisp. 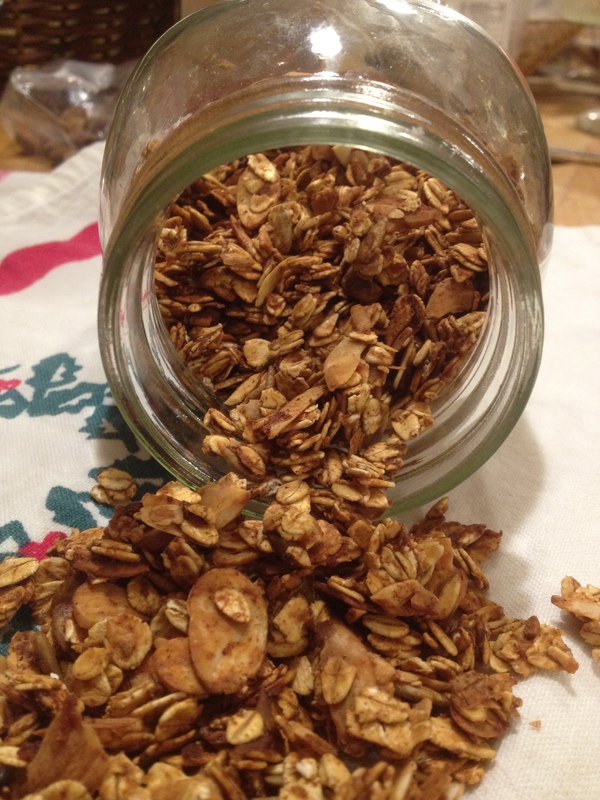 You need to do some simple taste tests to verify the granola has crisped up enough at the end and not chewy.